Autumn has arrived with its beautiful display of gold and red leaves. Unfortunately, it has also brought with it various germs (=very small living things that cause disease). Many of us are now suffering from colds and, if we are really unlucky, flu (=a very bad cold, but with pains and a hot body). If you have caught a cold (=got a cold) or come down with (=started suffering from) the flu, you will probably want to tell someone about how bad you feel. You might tell a good friend, who will be kind to you, or even a doctor if you are really poorly (=ill). Here, then, is a selection of words and phrases that you can use to describe your symptoms (= physical feelings that show you have a particular illness). Let’s start with the nose. You may have a runny nose, with liquid coming out of it all the time. (A cold with a runny nose is often described as a streaming cold). Or your nose may be bunged up or blocked (up), meaning that you cannot breathe through it. If any of these phrases describes your symptoms, you will probably want to blow your nose – to clear your nose by forcing air through it into a piece of soft paper. A cold often brings with it a sore throat (=a hurting back part of the mouth). Often, it makes you cough (=have air come out of your throat with a loud sound). If that cough is particularly loud and sounds as if it hurts, you might describe it as a hacking cough. Another nasty symptom of colds and flu is a headache (= pain in your head). A headache that is especially painful is often described as a splitting headache. As well as having a headache, you may find that your whole body aches (=hurts continuously). 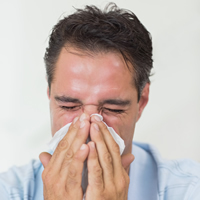 Another unpleasant symptom is a fever or temperature. If you have a fever/temperature, your body – especially your head – is hotter than usual. If your body is very much hotter than usual, you might describe it as a raging fever. Eventually, the cold or flu will go away and you will get over it or get better. When you are feeling 80 % better, you might describe yourself as over the worst. If you are completely better, you may say you have recovered. If you have recovered very successfully and are now feeling completely healthy, you may say you have bounced back. Finally, no blog on this subject would be complete without man flu, (a phrase which you may or may not like). If a man is said to have ‘man flu’, the speaker thinks the man has a little cold, but the man suffering from the illness is certain he has raging (=very bad) flu. Thanks a lot! Definitely, there’s no better way to learn how to communicate in another language than from native people. Not very informative at all! If you want to help people with definitions, help them understand that the flu (influenza) is NOT the same as a cold. It’s a separate virus and much more dangerious. Many people think they have “the flu” any time they get sick. This may lead them to believe silly myths like flu vaccines don’t work. thank you for this article, its really useful. could you please write an article about healthy diet children age 6-15. if you could state what kind of food good and why is that food good and also recommended by who. thank you again. Very useful, thanks a million! Stunning issue for learnings, thank you so much!!! I’d like to say thank you very much. I could learn a lot from here. New words and how to use and where to use. This helps me to improve my English. Pardon me if there’s any mistake.